Can We Ever “Understand” the Mass? HE CLAIM that the common people, before Vatican II, did not understand the Mass—that they no longer understood what it meant, the significance of its rituals and prayers, and so, as a result, the liturgy had to be updated, modernized, simplified—can be decisively refuted. First, as is well attested in writing and photographs, all over the world there were immense numbers of Catholics who loved the liturgy and attended it as often as possible—including ordinary peasants and manual laborers. Whatever they cognitively derived from the exact prayers or gestures is insignificant compared to the overall shape, the seriousness and focus, the opportunity to adore in fear and trembling, which the sacred liturgy provided for their spiritual lives. (Related to this fact is the extremely strong preconciliar participation in the sacrament of penance, which also went out the window after the “reform” of the liturgy—perhaps suggesting a more than incidental connection between the form of the Mass and the virtue of penance itself.) The credibility of this historical data is verified by the crowds of people, young and old, who today devoutly and devotedly attend the Tridentine Mass wherever it has been re-introduced, because of the mystical attraction it exercises over serious Catholics who recognize it as a profound immersion in the prayer of Jesus Christ and His Church. Second, due to the Liturgical Movement in its original fervor, countless missals and prayer books were published and disseminated, containing clear translations of, and often meditations based on, the prayers and gestures of the Mass. As Joseph Ratzinger recollects in Salt of the Earth, there were even “graduated” missals for children, so that at each stage of their maturity they could take one further step in intimacy with the Church’s grand liturgy. 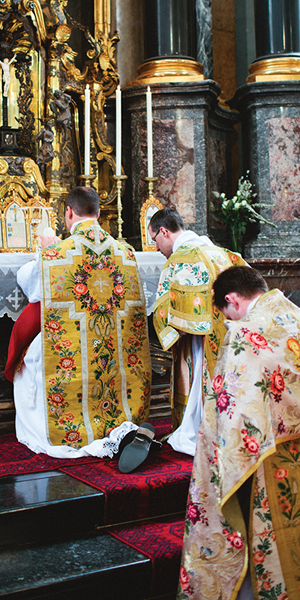 People everywhere grew familiar with the Mass, its calendar, ritual, processions, and music, in a far deeper way than anyone now does with the Novus Ordo; the liturgy grew into their hearts, it took root there and found a permanent home. There was never a lack of opportunities for the faithful to enter into the letter and the spirit of the liturgy. A particularly fine example of the resources made available in the nineteenth century would be The Liturgical Year by Dom Gueranger, which continues to nourish readers today. And a last point should be recalled, in our era more than ever, when preaching has reached an all-time nadir in both content and style. If there was occasionally some failure to understand or appreciate the spiritual-theological depths of divine worship, this was chiefly the fault of priests and bishops. It is their duty to preach about the liturgy no less than about Sacred Scripture and Catholic doctrine, and, in the preconciliar period, faithful priests did just that—witness Romano Guardini’s beautiful Meditations Before Mass, intended for and well appreciated by the “people in the pews.” We see here the pastoral solicitude urged by Pope Francis when he tells pastors to feed their flocks. A concerted, widespread effort to preach the Mass in all its richness would have sufficed for stirring up a profound renewal of the participation of the faithful at the time of the Second Vatican Council and into our times. This prudent and courageous approach appears never to have been even considered; the choice was made, instead, to simplify to the point of infantilism, so that there would be nothing that needed explanation—which is to say, nothing of mystery, nothing profound, nothing transcendent, nothing rooted in ageless tradition. The reformed liturgy represents the final capitulation of the priesthood to the democratic spirit of modernity: the priest gave up, or was practically compelled to give up, his role as teacher and ruler. As the sociologists and anthropologists were saying back in the seventies, those who take away the density of ritual and the solemn beauty of the ineffable will not gain more worshipers; they will merely give them more reasons to go away and find something more interesting to do. Let us do our part to see to it that our own efforts to worship Almighty God (and, depending on our calling, to improve the ars celebrandi of the public worship in which we play some role) are based on a sane and sound understanding of the very heart of worship—the grandeur, majesty, transcendence, and holiness of God, which we cannot comprehend and which we do well to fear and to love with all our souls.